The enjoyment of a day at the racetrack brought to you at a venue of your choice. 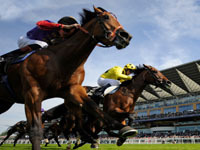 A race night is an event were participants place money on the outcome of recorded races. The takings of a race night, after expenses of the entertainment must be devoted to purposes other than private gain. Race nights are great entertainment and an excellent way of raising funds whatever your fund raising event. Why not incorporate the race night into your corporate event? At Roadrunner Discotheques we supply all the equipment to run a race night, the races, big screen TV’s, projector, sound system, tote tickets, rosettes and professional race night compere. RacesOn a race night we will be able to take you through a minimum of 8 races with a bonus race were we could auction the horses. There are 8 horses in each race, some of the races will be on the flat and some will be over the jumps. Each race will be picked from a bag chosen by a member of the audience so that no one knows who the winner is before the race. Tote table & winningsRoadrunner Discotheques will supply thermal printed tickets for each race. Each race will have eight horses, we will sell the tickets off before each race, and then the sales for that race will be calculated by our computerised betting system where the odds will be worked out for each horse automatically. The funds raised will then be divided between the charities of your choice, the remainder will be divided against the winning tickets. We are also able to supply rosettes for the winning horse owners and jockeys. The higher the ticket prices the greater the money raised. You could get each of the eight races sponsored by local businesses before your race night, e.g. The Bakery handicap. On booking your race night we will send you a program with all the races on, all horses and jockeys will be named. Also before and on your race night you could sell ownership to each horse and the jockeys. Another good idea is called Loser to Winner, with this all the race night losing tickets (with the ticket owners name written on the back) go into a box on the tote table. On the last race 8 names are pulled from the box and each get a free ticket for that race. This adds to the entertainment on your race night and clears away all the losing tickets. To add some fun to your race night and make extra money for your fundraising event, run an extra race and auction the horses. Everyone bids on each of the eight horses and the highest bidder wins the horse, once again the charity takes a percentage of the money and the rest of the winnings go to the winner.